Welcome to Cisco Packet Tracer CCNA Labs Adventure 2 ! Cisco Packet Tracer CCNA Labs Adventure 2 aims to teach how to configure network protocols on Cisco Switches and Routers for the students that are preparing theirselves to Cisco CCNA Exam. With Cisco Packet Tracer CCNA Labs Adventure 2 students will learn a lot of network protocols and their Cisco configurations. In this course especially we will focus on Routing Protocols, IPv6, ACLs, Redundacy Protocols, Subnetting, SNMP and more..
Cisco Packet Tracer CCNA Labs Adventure 2 is the second part of CCNA practical course with Cisco Packet Tracer. If you did not check Adventure 1, to cover whole CCNA lessons, you need to check it too ! For the rest of the configurations of CCNA, you can start or continue with Cisco Packet Tracer CCNA Labs Adventure 1. After completing both Adventures, you will be ready for Cisco CCNA Exam! Good Luck! Hey Buddy!, I found this information for you: "Cisco Packet Tracer CCNA Labs Adventure 2". 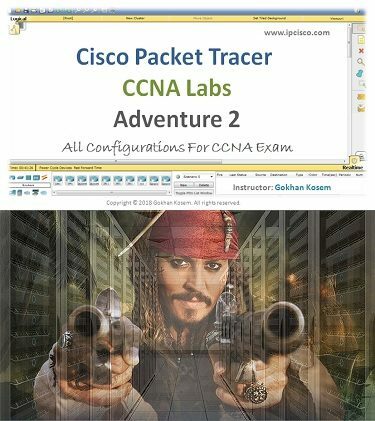 Here is the website link: https://ipcisco.com/course/cisco-packet-tracer-ccna-labs-adventure-2/. Thank you.